The Bangko Sentral ng Pilipinas (BSP/ Central Bank of the Philippines) releases 10 million pieces of the new one-peso coin this December 2011. The coin features the portrait of Dr. Jose Rizal to commemorate the hero’s 150th birthday on June 19 this year. 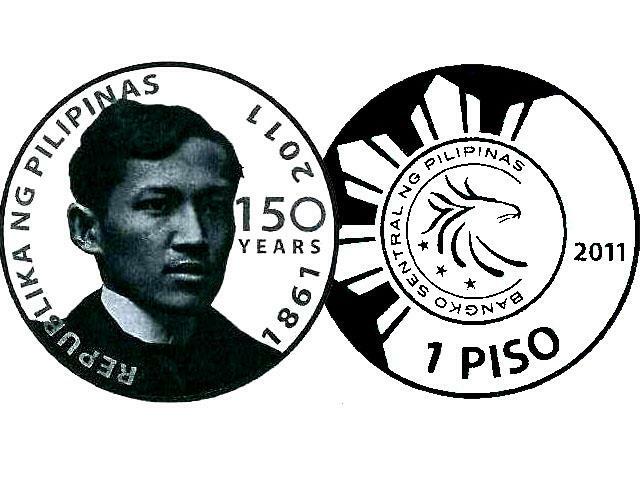 For many decades now, Rizal is still the face that owns the 1-peso coin. The BSP said its Monetary Board and the Office of the President approved the issuance of the commemorative coin as legal tender which was designed by Emerson RG Abraham. The words “150 years,” “Republika ng Pilipinas,” and “1861-2011” are etched on the front side of the grayish, nickel-plated coin. The reverse side carries the new BSP seal, 1-piso, and 2011. The coin is of the same size and weight as the old one-peso coin still in circulation: 24 millimeters in diameter at 5.35 grams. 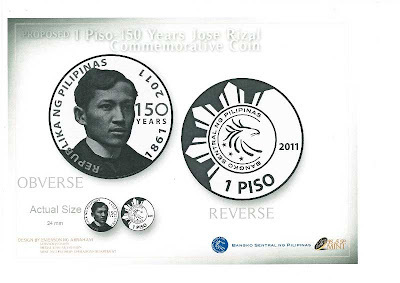 The BSP said that the issuance of the Jose Rizal coins is just one of the ways to commemorate the national hero in his 150th birth year. I wonder why our national hero was placed in a low currency coin. In June 2011, the central bank held an exhibit titled “Rizal in Our Midst: A Homage to Greatness,” which showcased old coins and banknotes that featured Rizal, including five centavos to 100 pesos released since 1903. Rizal is the Philippines' national hero, the author of 2 novels required for high school reading: Noli Me Tangere & El Filibusterismo. He was executed at Bagumbayan (now known as Luneta) on Dec. 30, 1896.